The Lynx Armoured Command and Reconnaissance Vehicle was developed by the former US firm FMC as a private venture (a vehicle not developed as a requirement by the US Army) it was adopted by the Dutch Army (AKA Royal Netherlands Army) and Canadian Forces. Designated by FMC as the M113-1/2 Command and Reconnaissance Vehicle, (AKA – M113 C&R, AKA ACRV) the first prototype was completed in 1963, using many of the components of the M113 series, which FMC was already manufacturing. Aluminium is a lighter material than steel because its not as dense, so you need three times the thickness of steel to offer the same level of protection as steel. However aluminium is more stiffer than steel, so doesn’t need the steel bracing used in steel constructed vehicles, which means an aluminium vehicle is lighter, has more internal room and a lower profile making it a harder target to hit and for these reasons the vehicle was constructed of aluminium. The vehicle has a slightly different layout compared to other vehicles of this size/role/class. The 6V-53 GMC Detroit Diesel 215hp engine is set in the rear of the vehicle, with the crew set forward, rather than the other way round. Access to the engine is via a right hatch and a roof hatch. It had an operational range of 523km and top road speed of 71km/h. The vehicle was fully amphibious and propelled by its tracks (top speed 6km/h) with bilge pumps running and a trim vain erected at the front. The driver is seated at the front of the vehicle on the left side with a hatch cover that opens to the rear with an integral M19 infrared periscope mounted in its roof and five M17 day periscopes. The commander operates the .50cal MG mounted on his cupola (M26 turret), which has a 360° manual traverse and can be operated from within the vehicle. His position is located in the centre of the vehicle. The third crew member, the radio operator/observer, is seated to the right of the driver. An access door was behind the observer on the right side of the vehicle. The first country to purchase the vehicle was the Netherlands in 1966, with a total of 260. 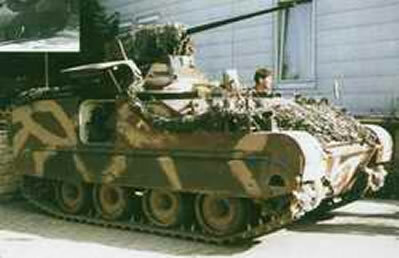 In the 1970’s they upgraded theirs with an Oerlikon-Bührle GBD-ADA turret mounting a 25mm KBA auto-cannon. Canada purchased 174 vehicles in 1968 under the designation “Lynx”. Their layout was modified so as to have the commander offset to the right, with the observer moved to the left behind the driver. The right hand side hatch was removed and an escape hatch inserted in the floor. The Canadian Lynx was withdrawn from service in 1993, and replaced by 203 Coyote eight-wheeled reconnaissance vehicles by the end of 1996. Those vehicles are now in storage, used for monuments or donated to other organisations such as Bovington Tank Museum, which is the one featured in the above video recorded by Admin.